Searching for fine dining with an amazing view in West Vancouver? Look no further. En route to the North Shore mountains for a ski or a perhaps a hang glide, one might notice a sleek, concrete and stone exteriored restaurant set amid some of the grandest homes in British Columbia. Fraîche Restaurantis a destination dining experience well worth the trek up Chippendale Road.Jefferson Alvarez is a brand new reason to visit one of the most breathtaking dining room views in our city. The former Divino Wine Bar chef — whose faint faux hawk may or may not lend to his gutsy kitchen ways — has taken the reins and is putting a worldly spin on the menu. The Canadian Lobster Sandwich ($20) struck me as a suitable lunch selection considering my luxurious surroundings. 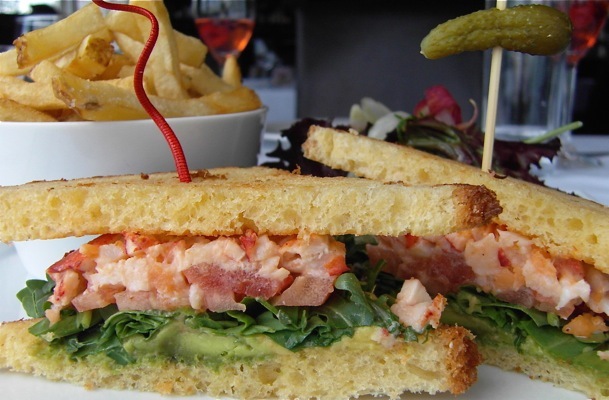 Tender lobster —chopped and tossed in a citrus aioli — rested between olive oil toasted, avocado smeared white bread. Fresh tomatoes and arugula added further freshness. Though fries aren’t often worthy of a mention, Fraîche’s version, which were well done and sea salted, were addictive. Alvarez assured me he would continue to add his flair to the menu, so stay tuned for ongoing updates.